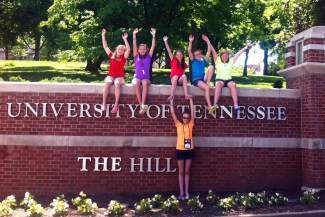 More than 1,200 teams of students from the United States and around the world traveled to Knoxville, Tenn., at the end of May for the Destination Imagination (DI) Global Finals. Among them were the members of “Wait, … What?” — Summit County’s first team to make it to the highest level of the competition. Upon learning that they qualified for globals in early May, the six girls — Cassidy and Delani Bargell, Sarah Burke, Anna Mathis, Sydney Vargo and Mairi McAtamney — went into a flurry of fundraising within the community to raise enough to cover entrance fees and transportation costs. They were successful and all were able to make it to Tennessee. More than 14,000 people attended the competition, from the United States to places like Poland, Turkey and Korea. Co-team manager Karen Mathis compared the atmosphere of the event to that of her experience at major venues like the Olympics. The Summit County team went up against 75 other teams of their age level. Destination Imagination, a nonprofit organization, creates challenge programs and competitions to encourage learning and problem solving through creative means, with focus on science, technology, engineering, mathematics, the arts and service learning. Each competition consists of a challenge round and an instant challenge round. Teams prepare for the challenge round ahead of time and must think on their feet for the instant challenge round. Team “Wait, … What?” has been competing at the state level for the past five years, but even so, they were not expecting to perform in a large auditorium filled with hundreds of people. Still, they didn’t let it faze them for long. There was more to the Global Finals than just competition, however. With teams of students coming from all over the world, interaction between different cultures occurred every day. The Summit County team was paired up with a team from Colombia. Language was not an issue, as the Colombian students spoke some English and the Summit County students, all coming from Dillon Valley Elementary’s dual-language program, speak Spanish. Throughout the day, when they weren’t competing, the students went from activity to activity, from a talk by a National Geographic photographer to a duct tape ball where each dress and costume was made only out of duct tape. Now, the girls will have a break until next January, when they will start practicing for Destination Imagination competitions again. They enjoyed their experience so much that they’re considering putting on a workshop for the other Destination Imagination teams at Dillon Valley Elementary. The team also hasn’t forgotten that they couldn’t have gone all the way to globals without the help of Summit County.